AUGUSTA, Maine (AP) — Lawmakers heard hours of testimony on obscenity and censorship as they consider a proposal to require teachers to notify parents before using books with sexually explicit material in lessons. RICHMOND, Va. (AP) — A legislative panel rejected a bill protecting student journalists from administrative censorship on a tie vote Monday. BEIJING (AP) — Chinese internet users lost access to Microsoft's Bing search engine for two days, setting off grumbling about the ruling Communist Party's increasingly tight online censorship. RICHMOND, Va. (AP) — Two delegates, both former journalists, introduced legislation Monday to protect student journalists from censorship and shield reporters from having to disclose confidential sources. "Journalism matters. Facts matter," Roem said. "We have to get this right." CAIRO (AP) — An independent union of Sudanese journalists launched a strike Thursday in support of "legitimate" popular demands for freedom and democracy, the latest in a series of work stoppages and protests calling for longtime President Omar Bashir to step down. A union statement said the three-day strike is also a protest against authorities' "barbaric" assault on press freedoms, including censorship and confiscating newspaper editions. ISLAMABAD (AP) — Pakistani journalists, who have taken on military dictators and been beaten and jailed in the pursuit of a free press, say they now face a form of censorship that is more subtle but no less chilling, one spearheaded by the security services. MOSCOW (AP) — The Russian parliament has announced a rap song competition amid a crackdown on contemporary music that evoked Soviet-era censorship of the arts. SPRINGDALE, Ark. (AP) — Students have complained that heavy-handed oversight of their now-suspended northwest Arkansas school newspaper could result in censorship and jeopardize their journalistic integrity. WASHINGTON (AP) — The Trump administration imposed sanctions Monday on three senior North Korean officials for human rights abuses in the isolated country. U.S. officials said the sanctions are intended to call attention to "brutal" censorship and human rights abuses as well as the death last year of American captive Otto Warmbier. CLEVELAND (AP) — A conservative advocacy group suing Kent State University officials argues the Ohio school is impeding free speech with a $1,800 fee to provide security for a planned gun-rights discussion at the student center. In a lawsuit this week, Liberty Hangout alleged its student club at Kent State is being treated unfairly because of its viewpoints. It argued the fee for eight police officers and six guards at the Nov. 19 event amounts to censorship. CAIRO (AP) — Amnesty International on Friday urged the Sudanese government to halt what it describes as "relentless harassment, intimidation and censorship of journalists" in the country. NEW YORK (AP) — The far-right Proud Boys and their founder, Gavin McInnes, have been banned from Facebook and Instagram because of policies against hate groups, the company announced. McInnes criticized the ban in an email Wednesday, saying it was a way to drum up "hysteria" prior to the midterm elections next week. "The left knows they are going to lose this election so they are ramping up the hysteria with fake news and censorship in a last ditch effort to win," he said. CARACAS, Venezuela (AP) — Google has unveiled a tool meant to help fight press censorship around the world, testing it first in Venezuela, where journalists say they're battling a government bent on burying online stories that expose corruption and human rights abuses. SEOUL, South Korea (AP) — While governments around the world ponder how to deal with the explosion of "fake news," South Korea has come out swinging, vowing to use its criminal laws to curb what officials have declared a threat to democracy. ALGIERS, Algeria (AP) — A French association of digital freedom and anti-censorship groups says its correspondent in Algeria has been arrested. Internet Without Borders said Abdou Semmar was detained Wednesday evening along with Merouane Boudiab, the associate director of an online news site Semmar founded, Algerie Part. NEW YORK (AP) — A New York federal judge has criticized U.S. government lawyers for seeking relief from him that they failed to get from the U.S. Supreme Court in a dispute over adding a censorship question to the 2020 census. Judge Jesse Furman made critical remarks at a Wednesday hearing as he withheld immediately ruling on the government's request to postpone a Nov. 5 trial on the subject. CHICAGO (AP) — Two conservative activists are criticizing DePaul University after the Chicago school denied a request for an on-campus event. BURLINGTON, Vt. (AP) — Armed with a new Vermont law that protects student journalists, four high school editors have stood up to censorship and won, prompting their school to revamp its media policy. BURLINGTON, Vt. (AP) — A Vermont school district says it will adopt a new policy in line with a state law aimed at protecting student journalists after students accused the Burlington High School of censoring a recent school newspaper article. Last week the principal asked the students to take down a story they broke on the student newspaper website about a school employee facing unprofessional conduct charges. 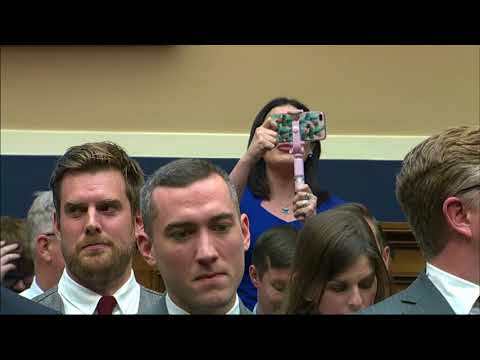 WASHINGTON (AP) — A House hearing about social media censorship was briefly interrupted as a protester stood up and yelled at Twitter CEO Jack Dorsey. Republican Missouri Rep. Billy Long drowned her out using his auctioneering skills. A woman stood up and started loudly yelling at Dorsey, complaining about bias and publicly pleading for President Donald Trump to help. President Donald Trump is again complaining that social media companies are "silencing millions of people." Trump tweeted Friday: "Can't do this even if it means we must continue to hear Fake News like CNN, whose ratings have suffered gravely. People have to figure out what is real, and what is not, without censorship!" The letter's contents were confirmed by a Google employee who helped organize it but who requested anonymity because of the sensitive nature of the debate. Alessandro Gallenzi of Alma Books said Calder died on Monday at Edinburgh's Western General Hospital after several weeks of declining health. BRUSSELS (AP) — For four centuries, the opulent, exuberant nudes of Peter Paul Rubens have been known to shock and delight in sometimes equal measure. And now, even in 2018, his Baroque paintings are still jolting the internet. Belgian museums are uniting in protest against Facebook since they cannot promote Flemish Masters including Rubens at will for fear of falling foul of the social media site's adult content rules and automatic censorship. JERUSALEM (AP) — Israeli Cabinet ministers have proposed legislation that seeks to outlaw photographing Israeli soldiers "for the sake of shaming them," a ban rights groups say would amount to government censorship. PORTLAND, Ore. (AP) — A federal judge has overturned a decision by school administrators in Oregon, who banned a student from wearing a pro-border wall T-shirt to school.